Sorry, I know this is my second or third post in as many days on the subject of Advent, but I'm really fascinated by this annual season of the Church Year that we Lutherans just started celebrating as of yesterday. It may last only 4 weeks, but I've really come to appreciate and respect this important time on the Liturgical Christian Church Calendar due to what it teaches us, reinforces, and helps us to prepare for. Most importantly, is something I want to try to establish as a new "family tradition" this year. "So while everyone on pinterest seems to think Advent is merely a prelude to Christmas -- a countdown to some bigger, more fun event -- we should remember Advent is much more. It’s a time to prepare, a time to reflect on our need for Christ, and a time to rejoice. Christ has already paid our debts. Christ is already victorious. Christ is already here, giving of Himself to us in His Word, His Supper, and His Baptism. It is an amazing blessing that we have in this season of Advent, that we have abundant opportunities to hear His Word preached, His absolution spoken to us, and to receive Him at the altar." "Yes, this kind of nostalgia can offer some enjoyment, warm fuzzy feelings, and many darling memories. However, the fluffy spirituality of 'believe in the spirit of Christmas' is quickly fleeting. By the time Christmas Eve rolls around many people are burnt out on the American Christmas. All the movies have been watched, the songs have been over played, and the fake Santa's have shaved off their beards. These traditions do not have much to offer beyond fun or memories. In fact these traditions can have a way of adding to the 'to-do list' and stress of the preparation rather than easing it with the peace of the season. So I whole hardheartedly have come to love the season of Advent. For one thing it slows me down. The season of Advent brings peace and rest in the mist of the holiday hustle. Advent is a season of somber waiting and preparation. The Church has taken the Advent journey from around the 6th century. Many Christians find Advent to be helpful and useful. Not because of the man made traditions but rather how the one true faith, as expressed in God's Word, shapes the traditions that have sought to build up and edify the people of God." "I totally get that when life is busy this can be a very difficult discipline to establish. Start with a little bit at a time. Keep your Bible, Hymnal, Catechism and devotions in a central location where you will remember them. Pick a time of day where all the family members tend to be gathered anyhow. One thing that tripped me up for a long tine was my ideology of wanting everything to go super smoothly and perfectly. I would get frustrated if it took to long to get organized or if the kids were too wiggly. Don't get discouraged. Devotions at home take practice, much like learning how to worship in the Divine Service. It's okay to start small adding a little bit the the routine at time. I have learned that when life is at it's busiest the habit of family devotions does not add to the business but rather provides much needed connection with each other, rest, peace." "One of the most common Advent Traditions is the Advent wreath, which is far from just another Christmas decoration. This is actually a fairly new tradition as traditions go. However, I think, it's a good one as it provides many teaching moments. Having an Advent wreath in our home has been helpful to my family as we track the weeks leading up to Christmas, as a new candle is lit each week. The anticipation grows with the brightness of the wreath. We typically light our Advent wreath during evening devotion time. An Advent wreath is is jam packed with simple symbolism which helps to keep us focused on Christ the light of the world during this season of waiting." "Please don’t feel like a successful Advent and Christmas rely on checking items off your list. The above suggestions are just that. The seasons are about far more than what we do for those around us, our families included. They are about what was done for us years ago when Christ came as a baby to Bethlehem. The most important part of Advent is remembering that while Jesus came to us long ago as a baby and will come again someday, He also comes to us now, every time we are in church. Of all the listed ideas, the most important is going to church with your family." 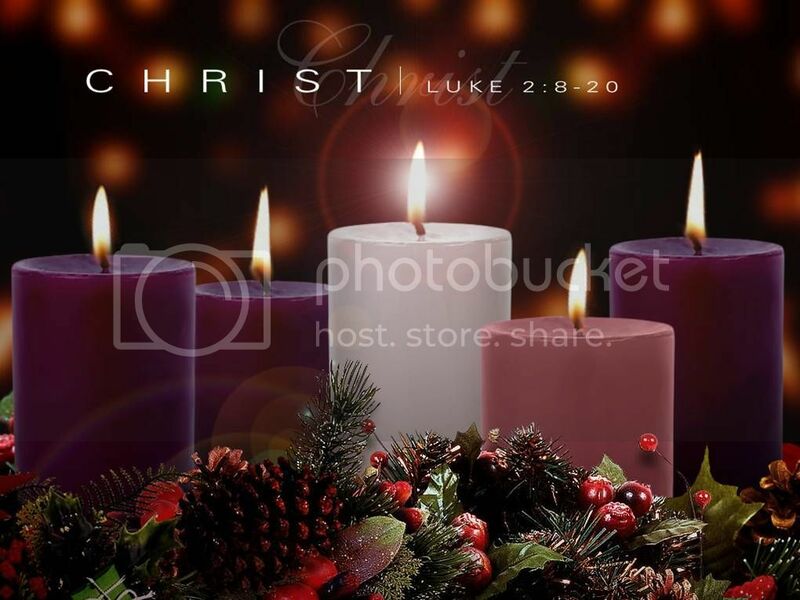 "Advent is a time to prepare for the coming of Christ. We prepare not just for celebrating his birth, but we get ready for the second coming and remember how he comes to us in our daily lives. The time of the year is hectic and busy with activities at school, work, church, and in the community, as well as all the family expectations. There’s also the pressure to locate the perfect gifts for everyone on our ever-expanding lists while sticking to a budget and not over-commercializing the holidays. In the midst of all this activity it can be easy to forget that Advent is more than some kind of pre-Christmas. With all that in mind, here some easy tips for incorporating this ancient church season into your modern family’s life." Now, as wonderful as all of this is, please be very careful that you don't become an "Advent Purist" to the point where your celebration of this beautiful time of year leads you to sin and burden others under the weight of the Law. I don't know, maybe it's because of the role that end times Bible prophecy used to play in my life and how I used to always study Jesus's Second Coming, or maybe it's just because it has to do with a topic we so rarely hear about anymore outside of 4 weeks during a calendar year, but I love that "Advent specifically focuses on Christ’s 'coming'" and that "Christ's coming manifests itself among us in three ways-- past, present, and future" as the LCMS FAQ succinctly noted. I pray that I won't be intimidated by trying to do something new this year like trying to start some new Advent family traditions, because Advent is such an important time of the year for those of us who are saved by grace alone, through faith alone, in Christ alone in helping us to patiently expect His coming, and that's what I hope to merely emphasize to my wife and kids. In a Lutheran layman's terms, there's a reason why Christ's Church (and the Lutheran church) has historically taken Advent as seriously as it does Lent each year.